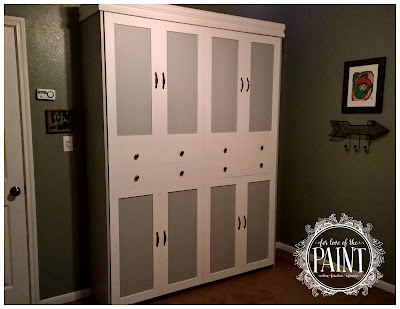 Home projects seem to be few and far between since work has been so amazingly busy, but we were able to finish this lovely Murphy Bed with a hardware kit from Rockler, a little elbow grease, and a LOT of help from my mother in law cutting boards and assembling pieces!! 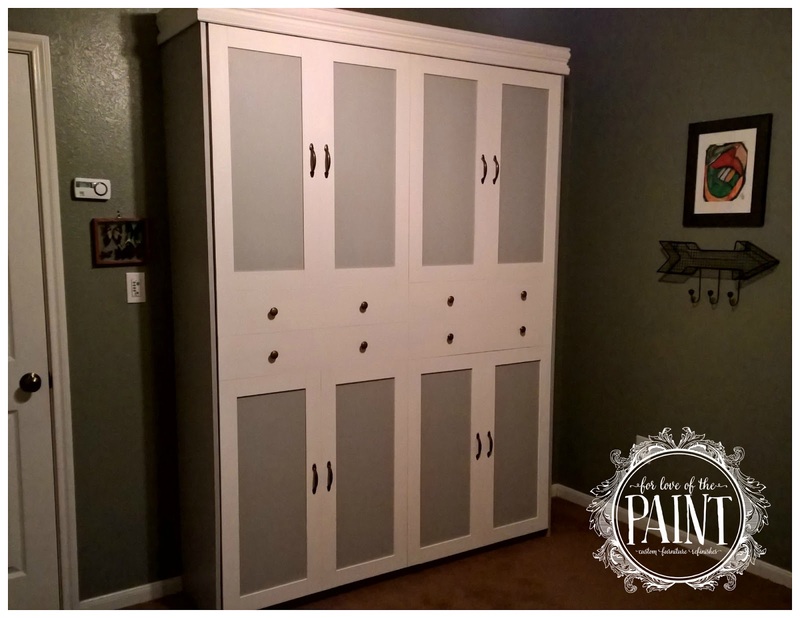 We chose Seagull Gray and Snow White milk paints from General Finishes to help integrate this piece into our guest bedroom. There were SO MANY tiny pieces of trim that I individually painted that I think next time we might try painting them with a coat or two as full boards before cutting them apart and then just doing final coats to make sure we got all of the sides and edges. It saves a TON of space, and folds out into a Queen sized bed! Perfecto! I also framed one of my daughter's awesome paintings because it fits amazingly with the modern/industrial chic vibe we plan to add in to this room. More on those projects soon(ish) ;) !! What other DIY home projects have you tried? I'm looking for my next great adventures! That is so awesome!! It's such a great idea and this is definitely one of the best looking ones I've ever seen. Thank you!! It was definitely a labor of love, and we LOVE having the space in the guest room when no out-of-town visitors are here. It's the perfect extra space to lay down tarp and get to work!! WOW! I've never seen a Murphy bed look so beautiful. Usually dull and lack lustre. Thanks, Sheryl!! It definitely was a huge upgrade to spend the time on the detail work :) And totally worth all the effort! I wanted it to look just as cohesive into the full room redesign as a traditional bedroom set would be. Thank you!